An erect profusely branched annual herb, growing up to a height of 1.5 metres. Flowers in racemes and roots are well developed. Dried stem is the officinal part. It is used against indigestion and urinal disorders, and is a chief ingredient of the ayurvedic preparation devashtagandha. Iruveli grows well in red sandy loam soil. Sandy and laterite soils are also suited for cultivating iruveli. Soils having pH 5.5-7 with low moisture content is ideal for profuse growth of the plant. The plant grows well in hot, humid climate and tropical and subtropical situation under irrigation. It can be cultivated as intercrop in coconut gardens and rubber plantations in the initial years by making ridges; and on mounds as pure crop in low land situation. Iruveli can be grown by seeds or stem cuttings. The crop is best raised from softwood cuttings. For preparing planting materials, stem cuttings of 10-12 cm long are planted in well-manured nursery bed during May-June. The cuttings initiate sprouting and grow well within a month. These rooted plants can be planted in the field during rainy seasons (July-August) at a distance of 20 cm x 20 cm. Approximately 84000 stem cuttings are required for planting in one hectare of land. Iruveli crop is raised generally using organic manure alone and chemical fertilizers are not commonly used. Organic manure in the form of compost or farmyard manure@ 10 t/ha should be applied. The entire amount of farmyard manure can be applied either at the time of land preparation or can be given in two equal splits. The field should be kept free from weeds by weeding and hoeing at regular intervals. Two or three weeding is necessary. Weeding can be combined with the incorporation of organic manure. Irrigation is necessary every third day in the initial stage of planting. After establishment, irrigate as and when required weekly or fortnightly depending on soil moisture condition. But in summer season, the crop should be irrigated regularly. Dried stem is the medicinally important part of the plant. The crop becomes ready for harvest 6-8 months after planting, flower emergence being the correct state of harvest. November-December months are ideal for harvesting Iruveli. The crop is harvested by cutting at the base and is then dried in sun. Approximately 2.5 tonnes of dried stem can be harvested from one hectare area. 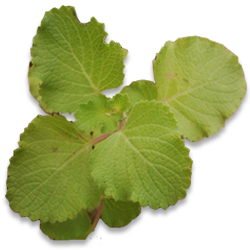 Iruveli is most commonly used against ailments like vomiting, diarrhoea, leuchoderma, fever, chronic liver diseases etc. It is used against indigestion and urinal disorders, and is a chief ingredient of many ayurvedic preparations like iruveli kashayam, devashtagandha, snana choornam etc.